Infinity Air & Vacuum Services carry out pressure vessel inspections on the Sunshine Coast. 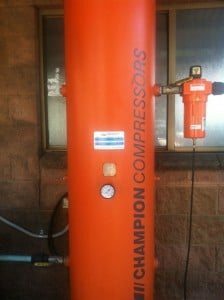 With many years in the air compressor industry, we are able to carry out on-site pressure vessel inspections that comply with the AS/NZ 3788 standards. We are able to come to your workplace and carry out the inspections at any time that is convenient for you and your plant demands. We always ensure that your downtime is at a minimum. Work Health and Safety Regulation 2011 requires that pressure vessels require periodic inspections and may need to be registered with Worksafe Qld. We will carry out the inspections at any time that suits your production demands. The inspections are carried out using state of the art thickness testing equipment, safety valves and pressure gauges are checked for calibration on site using a portable nitrogen test bench.